Based on Alan Ball's HBO hit series, True Blood, True Blood & Philosophy: We Wanna Think Bad Things with You, promises fans of both Charlaine Harris's Sookie Stackhouse novels and Alan Ball's True Blood that they'll have even more literary flesh to sink their fangs into! E-dition was released in June 2011, NOW available on iTunes! Both the first and second editions are being published in Spanish in 2013! Ole! Rebecca Housel is available for media interviews as an expert on vampire pop culture, Charlaine Harris literature, vampire literature, or Alan Ball; please visit our CONTACT INFO page for more information. Thank you. See the interview with world-renowned philosopher, Tom Morris, in The Huffington Post on the LINKS page! Rebecca Housel and J. Jeremy Wisnewski team up again in this latest volume of William T. Irwin's Blackwell Philosophy and PopCulture Series based on the 'twilight Saga' by author Stephenie Meyer. Organized into four sections with eighteen chapters, the book addresses the philosophical nature of the popular 'twilight' characters and books, including why Jacob is better for Bella than Edward, on being a vegetarian human...and vampire, is Bella Swan a feminist hero?, Carlisle Cullen's gift of compassion, are vampires and werewolves people?, and more.... Available for purchase at Amazon.com or all major book stores, including Barnes and Noble and Borders (both in-stores and online). Please also see www.wiley.com for more details on how to get a desk copy if you are an educator who wishes to use the book in the classroom. Find this book in English, French, Italian, German, Polish, Portuguese, and Russian! Available as an audio book as well as an e-book or kindle edition, too!!! Rebecca is available for interviews as an expert on the 'Twilight Saga'. Please see our "Contact Info" page for details--thank you. See Rebecca's interview featured in Marie Claire (Roma)! X-Men & Philosophy:Astonishing Insight and Uncanny Argument in the Mutant X-Verse is edited by Rebecca Housel and J. Jeremy Wisnewski . The book was released in March 2009 and features chapters on Wolverine, Deadpool, Magneto, the Dark Phoenix Saga , Mystique, Layla Miller, Professor Xavier, and more. Now available at all major book stores, the book may be found at Borders and Barnes and Noble (in-stores and online) and at Amazon.com. Please also see www.wiley.com for more details and to request an educator's desk copy if you would like to use the book in your classroom. This book is also available in Portuguese and as an e-book or kindle edition. Rebecca Housel is available to interview as a comic/X-Men expert for television/film documentaries, books on the subject or newspaper/magazine/e-zine articles. Please see our "Contact Info" page for details. Look for Rebecca in the 2011 American Masters PBS documentary on comic book superheroes written by Emmy-winning writer/producer, Thomas Wagner! Rebecca's first publications were in 2001, a series of five short novels best for middle grade readers but also designed for adult literacy at a second grade readability level. Rebecca, a native New Englander, based the books on research done in maritime libraries and museums, like Mystic, Nantucket and New Bedford. The books feature strong older child and teen protagonists who live in the nineteeth century and whose lives revolve around life at sea, the "connector" of that time period. 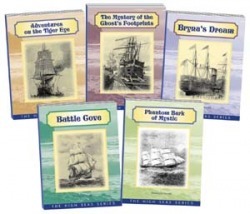 'Adventures on the Tiger Eye' is about a young man on his first voyage at sea on a whaling bark, hailing out of Nantucket; 'The Mystery of the Ghost's Footprints' takes place on a merchant schooner that calls the port town of Mystic home, where a young sister and brother must solve the spooky mystery aboard their father's ship; 'Bryna's Dream' is based on a true story of a Russian immigrant girl who gets separated from her family on her way to America; 'Battle Cove' is about two young recruits during the civil war assigned to steal oil from a northern whaling bark, but something goes wrong and the two are left in a life or death situation; 'Phantom Bark of Mystic' is the adventure of three young friends who live in the port town of Mystic, now being haunted by a ghostly ship that visits the harbor on foggy evenings but why? And who are the two shadowy strangers who seemed to appear out of the mist? Rebecca is available for interviews, quotes, forewards, book jacket blurbs on the subjects of middle-grade literature, young adult literature, literacy in America, and New England Maritime history 1775-1900. Please see the Contact Info page for more--thank you. Cambridge Scholars Press, UK, invited Rebecca to edit this volume on film adaptation in 2005. Rebecca has been the Area Chair for Film Adaptation for the Popular Culture and American Culture Associations since 2004. The book takes a critical look at how film adaptation functions within society, Hollywood, the arts, and literature using films from directors like Alfred Hitchcock to writer/director Charlie Kaufman and everything in between. Contributing authors include scholars from Japan, London, Denmark, Canada, and America in a truly transnational and international look at film adaptation from some of the leaders in the field today. Rebecca is available for interviews or comments, forewards, or blurbs for book jacket covers on the subjects of film, film adaptation, Hollywood history, and popular culture. Please see our "Contact Info" page for details--thank you.